Have you ever let the crazy in? You know … when people or things are crazy around you and it makes you all crazy on the inside. So crazy it makes your head hurt, or your heart ache, or makes you act in a way that doesn’t align with who you know you are. Crazy enough that you lose sleep, patience, and clarity. Yes, that crazy. Let’s face it. Sometimes we are the crazy. Whatever the case may be, it’s time to quit the crazy. We have important work to do in the world, beautiful days to enjoy, like-hearted people to connect with, 7-8 hours of sleep to savor. We owe it to ourselves and the people we love to keep the crazy on the outside. Connect to your breath not just as a remedy, but as preventative medicine by developing a daily practice that invites you to breathe. Over time, the stillness you create on the inside acts like a force field against outside craziness all day long. Some kinds of crazy require a really long walk, but often a short stroll to shake it off will do. If you really start thinking about how crazy the crazy is, laughter is inevitable. Take a bath. Cuddle a puppy. Call a friend. Do what it takes to soothe your soul. Don’t engage. Just notice. Write about it. Let it go. Your heart will thank you. Turn off the news. Don’t answer the phone. Remove the Facebook app. Make a little space for yourself to rest and renew. Maybe you let the crazy in, or discovered you are the crazy this time. Either way, forgive yourself. Start over. Perhaps you don’t have to do anything right now. Being you, being still, that’s enough for today. If you are feeling anxious, or worried, or upset about the craziness around you, engage in an activity you love or serve others with love. When you turn your focus to helping, you’ll forget all about the crazy. Choose to under-react. Choose to take a few (hundred) deep breaths. Choose a long walk. Don’t let the crazy in. 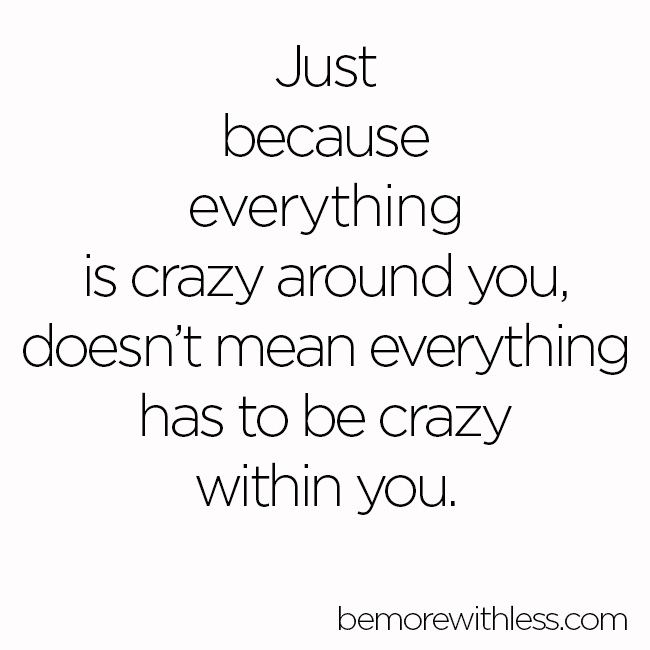 Just because everything is crazy around you doesn’t mean everything has to be crazy within you. 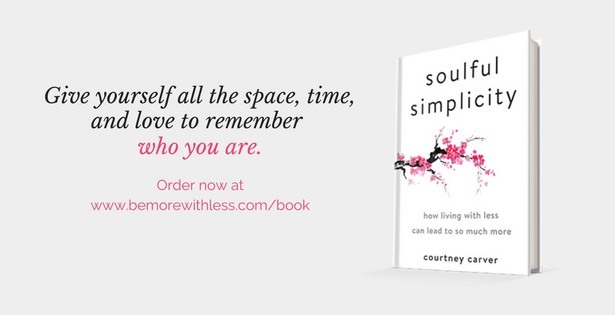 Courtney, thank you so much for this inspirational article! It is the answer to a prayer! I want to share it with a few family members because we are all “in the crazy”. It is now part of my morning routine to read and re-read. You continue to be an inspiration to me and though we’ve never met, I consider you to be a friend. Thank you for the time and love that you put into your writing and your work. 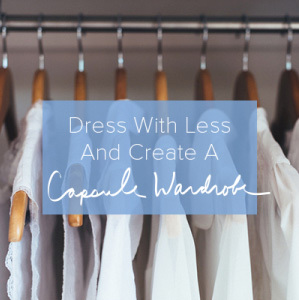 Learning to “Dress with Less” and to “Be More with Less” has helped me to enjoy life so much more! I am really looking forward to reading your new book. Keep up the great work! This may be my most favorite of your essays ever. Thank you. Love this, we have all been “the crazy” at some point. I get like that when I use facebook regularly. So I deactivated & reclaimed my mental health! This is great. This was me just over a year ago with certain family members. I decided to stop engaging, stop reacting to the provocation, stop obsessing about the unfairness and trying to make things right, and just remove myself from the crazy… I cut all social media connections (this was a particular strategy used to rile me up so I deleted them) and removed myself physically from being around them as much as I could. Surprise, surprise, the crazy continued but without me witnessing or being involved in their drama. I do see them very occasionally now the dust has settled, but boundaries have now been established. Life is calmer and so is my inner peace. Thank you so much. You have a true gift with words and a gentle, wise approach to life. You are a true gem and very inspirational – thank you. That’s a very fine compilation! A “firewall-update” for the soul. 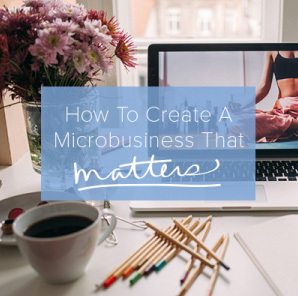 Hi Courtney, I love reading your blog and this article is perfect timing for me. However, since this is an article about mental health I wonder if you could use a different word than crazy, perhaps chaos. Society throws the word crazy around too easily. Mental illness is a serious issue and I feel that we make light of it when we use the word crazy. I am guilty of it myself and have been reminded that words are powerful. Thank you again for sharing all your wonderful wisdom. So true! The crazy can quickly surround us if we’re not careful. And it seems to get into our lives so easily! My favorite way to eliminate is to take a walk. Getting outside always tends to calm me and give me a fresh perspective. I choose deep breathing, laughter, and love. That’s how I deal with crazy! oh… this is so good. Thank you! This sounds like the first signs of stress, or a particularly insidious ‘gray zone’ before an actual breakdown. We move too fast through life, trying to juggle career, everyday stuff at the house, kids, spouses, hobbies, and – worst of all – a zillion social media or other passive mind locks. That can lead to such a ‘crazy’ state easily enough. Just this evening I thought about what the implications were for me, because I’ve been there so many times in the past. And the implications are simple as they are powerful: It is imperative that I watch for these signs and the pull the plug in time, and … just slow down. Take a walk. Do nothing. Or some of the things you suggested, which seem to ‘break the crazy’. It’s good to be affirmed that I’m not the only one thinking seriously about how to control this. Funny thing is that I had bookmarked this blog a while ago but not really had a look at it until I had an intuition to do so tonight, after having thought about … this stuff. A lot. Maybe I got that intuition because I actually took the time to just sit down and feel and think instead of the opposite. Whatever the case it certainly made me feel better. Thank you. Great list. I’ve employed a few of these in toxic jobs, but I especially love the “Leave” quote. The other thing that has worked for me is to change the tape. Sometimes the crazy is just a looping tape in my head and if I force it to another track EVERYTIME, eventually it seems to go away. It helps when I get obsessive (letting the crazy in).